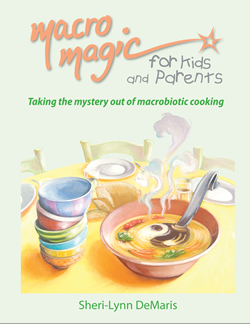 Macro Magic for Kids and Parents is a fun-packed, easy to read cookbook designed to teach the simplicity of macrobiotic cooking and eating well. One of the first unique healthy cookbooks of its time, Macro Magic for Kids and Parents offers recipes using only the finest natural organic produce, whole grains and grain sweeteners. Included is an abundance of information on healing foods, their properties and how to incorporate them into recipes. Author Sheri-Lynn DeMaris has practiced and studied macrobiotic cooking and philosophy for 26 years. She has studied and taught cooking throughout the US and abroad. Printed in full color throughout, this fact filled cookbook will delight readers of all ages.